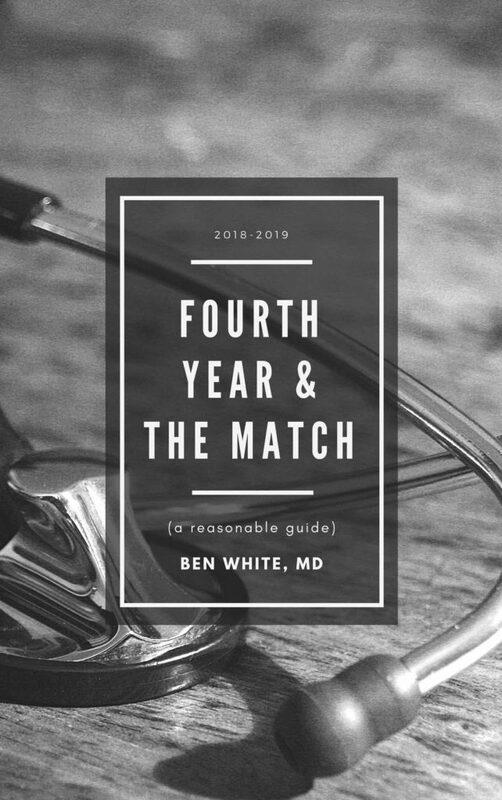 Get your free book download (ebook and PDF) of Fourth Year & The Match. If you’d like the book but aren’t interested in hearing from me, just click the instant unsubscribe link at the bottom of the download email. I don’t want to pester you. If you spend too much time on the internet like me, you may have noticed the explosion of free giveaways in exchange for your email. That’s because for people who sell products, having a big monetizable email list to target for your wares is a huge part of selling expensive digital products like $300 online courses. As for me, I don’t want to sell you anything. I’m just finally finishing fellowship and am finally about to have a smidge more time for the M&M (Medicine & Miscellany) newsletter I’ve been planning for the past couple years. It’s more fun to write for more people. Most of these subscriber giveaways are ten slide PowerPoint PDFs and the like crufted together from a few blog posts you’ve probably already read. I’d like to think this is an exception. Fourth Year & The Match is around 21,000 words and will take about 2–3 hours to read. To be completely transparent, I’m planning for this book to be a temporary product. It’s a standalone component of a larger book project and likely my final big medical school-related effort (magnum opus?). I don’t know how much longer it will take me to finish this book because I’m struggling with several projects at once, and I want this out there to help current students. So, I’m putting it out for free. As long-time readers have likely noticed, I’ve been more interested in reaching people and hopefully providing reasonable/helpful advice over the past ten years than in making a bunch of money. But, in exchange, I would love your feedback. And I would love for you to share this with your classmates and friends. As I mentioned, I’m also using this as an experiment to generate some more readers and interest for my planned newsletter, which will be released on a sporadic and likely extremely rare basis (maybe quarterly, maybe less?). And again, if you’re not interested in getting emails from me, you can sign up, download the book, and then immediately unsubscribe. I wouldn’t hold it against you at all. As I write in the book, every meaningful opinion is going to have people that agree and disagree with it. No book could give you universally applicable advice on every possible scenario. I do sincerely believe that I’ve provided one pragmatic cohesive approach. When you’re done, let me know yours.